Meets all Federal and Provincial regulations. Course materials include the WHMIS Instructor Guide, PowerPoint classroom presentation, and participants guides. Includes Teaching Adults – Introduction to Adult Education Training Program. Also includes regular update notifications on changes to WHMIS legislation. The WHMIS 2015 instructor training package equips you with all the tools you need in order to train and certify your colleagues, staff or clients in the newly updated Workplace Hazardous Materials Information System (WHMIS 2015). You will also receive a physical copy of the WHMIS Instructor Guide, 10 WHMIS Participant Guides, and a WHMIS Handbook. Materials also include a flash-drive containing the PowerPoint training presentation for use in class. Shipping is included in the purchase price. All training materials reflect the current Federal and Provincial legislative compliance requirements. This comprehensive WHMIS Online Instructor Certification program has been developed in accordance with the Federal Hazardous Products Act for the training of persons who manufacture, work with or are ‘in proximity to’ hazardous materials in the workplace. Brent O. Verified Buyer I would definitely recommend this for anyone interested in getting their training certificate. Gerald S. Verified Buyer With a busy work schedule, it is nice to have opportunity to do course online. Robert H. Verified Buyer I found the experience very informative and well organized. The test at the end was sufficiently challenging to 'not be a walk in the park'. Dan R. Verified Buyer Very informative and all information required to complete the course is provided. Lucas K. Verified Buyer Excellent on-line training and easy to navigate content. Very convenient certification for busy people. Training can be completed in four to six hours. Work at your own pace with no time limit. Includes TDG amendment update service to keep teaching materials up to date. 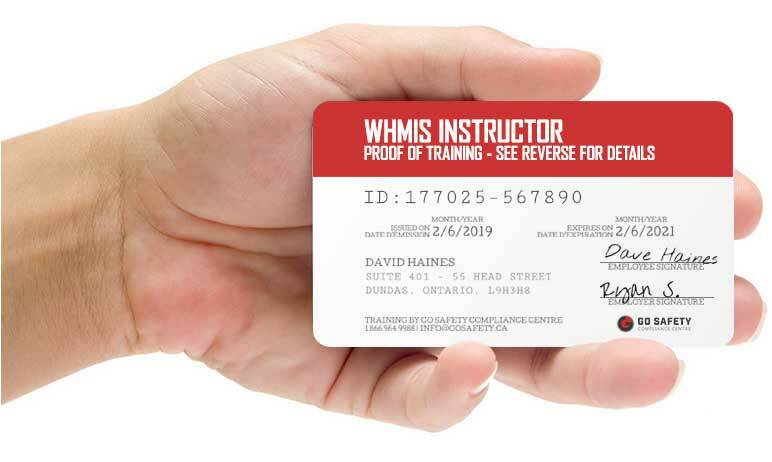 A sturdy plastic WHMIS Instructor wallet card may also be ordered directly from your Go Safety account for an additional fee. These hard-copy certificates are printed on durable 0.30mm polycarbonate plastic. Your record of training will be stored securely in your account for a minimum of five years should you need to reference it or provide proof of training. The record includes training details and completion date. All Go Safety certified instructors are required to provide each student with a copy of the WHMIS Participant Guide. The participant guide is designed to be used by a single student who is participating in an instructor-led WHMIS training class. Take advantage of Go Safety’s bulk pricing discount when you purchase the WHMIS Participant Guide for your students. WHO NEEDS TO TAKE WHMIS INSTRUCTOR TRAINING? Employers wishing to provide WHMIS 2015 certification in-house are required to have qualified personnel trained in the delivery of WHMIS certification. This program has been designed to meet both federal and provincial regulations surrounding the delivery of WHMIS 2015 education and training. WHAT TOPICS ARE COVERED IN THIS WHMIS TRAIN THE TRAINER COURSE? Also included in the WHMIS Train the Trainer course is Teaching Adults – Introduction to Adult Education Training Program. This program is free and will help you learn the fundamental skills of instructing adult learners. WHAT MATERIALS ARE INCLUDED IN THE WHMIS TRAIN THE TRAINER COURSE? 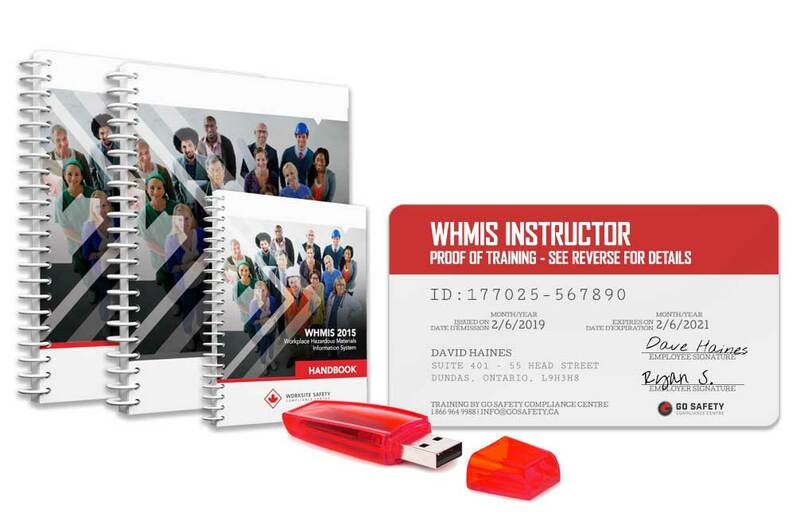 The WHMIS Participant Guide compliment the PowerPoint presentation that is provided in this Train The Trainer kit as a learning resource to your students and includes the serialized Worksite Safety Certification card for each student in the back of the book. Go Safety certified trainers are required to provide one Worksite Safety Participant Guide per participant, per class. HOW LONG WILL IT TAKE FOR ME TO COMPLETE THE WHMIS TRAIN THE TRAINER COURSE? Most students complete the course in about 4 to 6 hours, but there is no time limit to finish your training. You can pause the program and pick up where you left off later. Once completed, the training material will continue to be accessible to you for review purposes. You can write the exam multiple times until you achieve the passing grade of 90%. WILL THE ONLINE WHMIS INSTRUCTOR TRAINING WORK ON MY TABLET OR SMARTPHONE? HOW CAN I ACCESS MY WHMIS TRAIN THE TRAINER RECORD OF TRAINING? Your record of training is made available from your user account. This record is maintained by Go Safety for a minimum of five years and is available from your account at any time. HOW CAN I PURCHASE A WALLET CARD TRAINING CERTIFICATE? WHAT HAPPENS IF I LOSE MY WHMIS TRAIN THE TRAINER CERTIFICATE? CAN I PURCHASE WHMIS INSTRUCTOR TRAINING FOR SOMEONE ELSE?